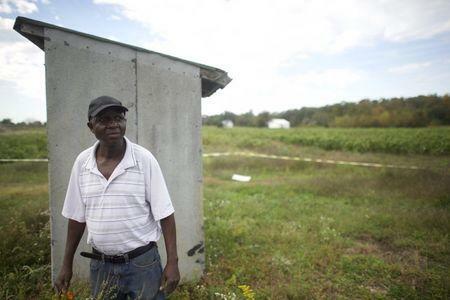 VINELAND, N.J. (Reuters) - Craving a taste of his native Liberia 4,500 miles (7,200 km)away, maintenance worker Alfred Jones drove just 20 miles from his New Jersey home and waded knee deep into rows of pick-your-own African vegetables at Morris Gbolo's World Crops Farm. The Garden State's newest crops were ready for harvest and Jones plucked baseball-sized eggplants known in Liberia as bitter balls and a tiny yet tangy plant called kittely to make the traditional stews he loved as a boy. "It tastes and smells very much like home," said Jones, 75, who emigrated in 1979 and lives in nearby Glassboro. 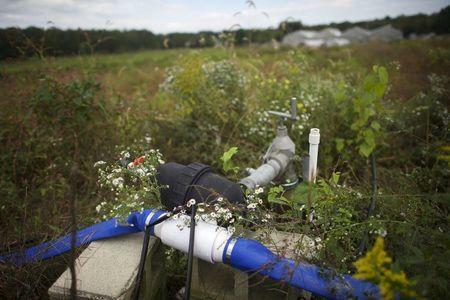 New Jersey, officially nicknamed "The Garden State" since 1954, is striving to revitalize its farming sector. It is seizing on trends such as the "Eat Local" movement, agritourism and ethnic crops that appeal to a growing population of Asian, Hispanic and African residents, including those flocking to Gbolo's fields in Vineland. The slogan has long confounded travelers whose only glimpse of the state is from its New Jersey Turnpike, with views of refineries and gargantuan fuel tanks. But the state has found new ways to pump up its Garden State credibility, boosted by proximity to neighboring New York City and Philadelphia, whose citizens often consider New Jersey their own backyard. With roughly one-tenth of the U.S. population living within 100 miles of central New Jersey - much of it affluent - the state is in a geographic sweet spot for agritourism, said Brian Schilling, a specialist with Rutgers Cooperative Extension, linked to the state university. Even at $150 a ticket, Farm to Fork dinners regularly sell out, and a Tour de Farm cycling and tasting tour that started in 2013 with 100 riders has grown exponentially to more than 1,000 riders, said organizer Mitchell Morrison. New Jersey's location is the reason the legislature approved the nickname in the first place in 1954, said Richard VanVranken, a Rutgers agricultural agent. "It was about everything in New Jersey being ripe for the picking for New York and Philadelphia. That drives a lot of what we do, being able to serve the huge markets that we're right in the middle of," VanVranken said. Riding new trends, the state is moving to recover its footing: The state had 1.7 million acres (690,000 hectares) of farmland in 1950, an expanse that has shrunk to 715,000 acres today, said New Jersey Agriculture Secretary Douglas Fisher. Since hitting a low point in the 1990s, when number of farms dropped to 8,100, that count has risen to 9,100, many of them serving niche markets. What is more, New Jersey is still a vegetable-producing powerhouse, ranking among the top 10 producers of crops including cranberries (third biggest in U.S.), bell peppers (third), peaches (fourth), spinach (fourth), cucumbers (fifth) and blueberries (fifth). But the state also is sowing seeds of innovation to cultivate its appeal to an increasingly urban and immigrant market. Agritourism is now a source of income for one in five farms in New Jersey, which relies more heavily on agritourism than other states, Schilling said. While New Jersey ranks 40th in the U.S. in total farm sales, it is ninth in the nation in terms of agritourism income, he said. To insure a fertile future for the Garden State, Rutgers agricultural agents put to work the results of a 2006 study of Asians and Hispanics on the U.S. East Coast that found they tend to spend more money each month on fresh fruits and vegetables than the national average and that purchasers of ethnic foods put food freshness ahead of price. Agents reached out to farmers such as Gbolo, who fled his Liberian home amid a civil war in 2002 and wanted to get back to farming. 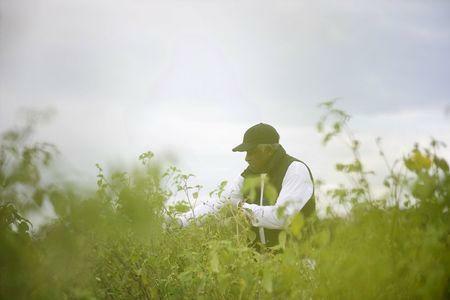 With Rutgers' help, Gbolo grew a first crop of African vegetables in 2009 on a small plot leased from former New Jersey agriculture secretary Art Brown. Six years later, Gbolo owns a 13-acre parcel and competes with Brown for customers who earlier this month harvested cassava and African black nightshade - to cook the leaves, avoiding the poison berries. Gbolo keeps a list of the myriad names for each vegetable - depending on the customer's native land - and it came in handy when his cellphone rang out in the field. "You got sour-sour? How about clan-clan?" asked a woman on the other end of the phone, using the Sierra Leonean names for roselle and jute. Both were ready for picking, Gbolo said. "Alright - I'm coming tomorrow," she said.